ABBOTT PARK, Ill., April 26, 2017 /PRNewswire/ -- More than 48 million surgeries happen in the U.S. each year,1 and for many of those patients, food is off the table in the hours prior to their procedure. According to a new survey of 1,015 Americans, supported by Abbott, a majority (79 percent) of the respondents who had undergone surgery were instructed by a doctor not to eat or drink before their surgery.2 Yet, surgical guidelines from organizations including the American College of Surgeons and the latest research recommend that certain nutrition should be consumed before and after surgery to help patients have a faster recovery, allowing them to get back to daily activities. 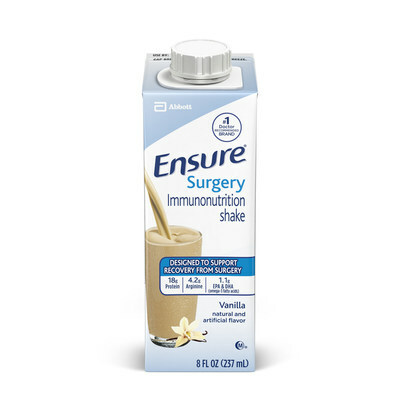 Ensure® Surgery Immunonutrition Shake is for people to drink in the week leading up to and following surgery to provide nutrients, such as arginine and omega-3 fatty acids EPA and DHA, to help with immune health and recovery. 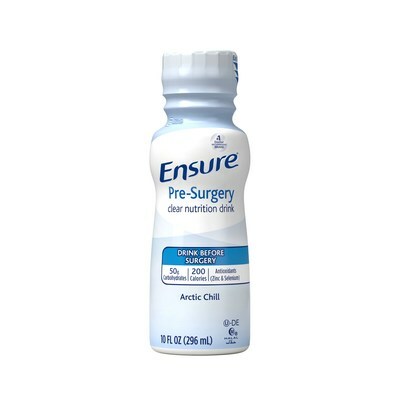 Ensure® Pre-Surgery Clear Nutrition Drink allows patients to consume a carbohydrate drink up to two hours before surgery, helping to reduce insulin resistance and improve patient outcomes. "Preparing your body for surgery is similar to training for a marathon," said Christina Sherry, PhD, RD, scientist at Abbott. "Just like you wouldn't fast before a big race, you want to prepare your body to have the strength and energy needed for a major procedure. Getting the right nutrition before and after surgery is an important part of the recipe to support healing and recovery." Several organizations, including the Enhanced Recovery After Surgery (ERAS®) Society and the American College of Surgeons, have created guidelines and protocols that are designed to improve recovery from surgery. In addition to recommendations around exercise and to stop smoking, the guidelines include the importance of nutrition for patients before and after surgery. Some leading hospitals and health systems, including Duke University Hospital, have implemented nutritional guidelines into pre-and post-operative care and have seen an impact on patient outcomes. "Given the evidence we have today, all patients undergoing a major surgery in the U.S. should have a nutrition assessment and be given the proper nutrition that will help them recover," said Paul Wischmeyer, MD, anesthesiologist and critical care specialist, Duke University Hospital. "The medical community needs to come together and abandon the current practice of preoperative fasting after midnight, so we can help give our patients the best chances of success and get them back to enjoying their everyday activities." Applying nutrition guidelines and recommending nutrition allows hospitals and doctors to help even their sickest patients rebuild the strength and energy they need to recover faster. In addition, patients can continue to use Ensure® Enlive® advanced nutrition drink for 90 days after surgery to help rebuild lost muscle and regain strength and energy. Introduced last year, Ensure Enlive provides all-in-one nutrition, including 20 grams of high-quality protein and the unique ingredient HMB (β-hydroxy β-methylbutyrate). All three products are now available for hospitals and pharmacies nationwide, and can be purchased on Amazon and the Abbott Store. Ensure Enlive can also be found nationwide at major grocery and mass merchandise stores. At Abbott (NYSE: ABT), we're committed to helping you live your best possible life through the power of health. For more than 125 years, we've brought new products and technologies to the world -- in nutrition, diagnostics, medical devices and branded generic pharmaceuticals -- that create more possibilities for more people at all stages of life. Today, 94,000 of us are working to help people live not just longer, but better, in the more than 150 countries we serve. 2 Survey conducted by Clarus Research with support from Abbott. The survey interviewed a nationally representative sample of 1,015 men and women over 18 years old during April 2017. 3 Marik PE, et al. JPEN J Parenter Enteral Nutr. 2010;34(3):378-386. 4 Drover JW, et al. J Am Coll Surg. 2011;212(3):385-399.e1. 5 Marimuthu K, et al. Ann Surg. 2012;255(6):1060-1068. 6 Cerantola Y, et al. Gastroenterol Res Pract. 2011;201:739347. 7 Reis AM, et al. Arg Bras Circ Dig. Apr-Jun 2016;29(2):121-125. 8 Hausel J, et al. Anesth Analg. 2001;93;1344-1350. 9 Canbay O, et al. Int Urol Nephrol. 2014;46(7):1329-1333. 10 Wang ZG, et al. Br J Surg. 2010;97(3):317-327. 11 Hausel J, et al. Br J Surg. 2005;92(4):415-421. 12 Singh BN, et al. Surg Endosc. 2015;29(11):3267-3272. 13 Smith MD, et al. Cochrane Database Syst Rev. 2014;8:Cd009161. 14 Ljungqvist O. Best Pract Res Clin Anaesthesiol. 2009;23(4):401-409.